African American Bridal is dedicated to providing our customers with unique products and services that extend your personality, culture and heritage to your surroundings, and express and celebrate your distinct qualities. We do this by offering vendor space to local entrepreneurs and African entrepreneurs to find the best selection of prints, carvings, unique household items, and limited-edition custom designs by local artist. 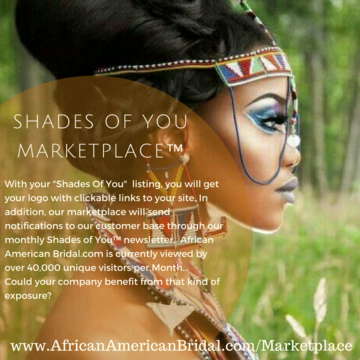 We've categorized our vast selection to make it easy for our customers to find exactly what they're looking for..
We are now taking applications for our " Shades Of You Marketplace™". With your Shades Of You listing you get the following at great prices! 3. chat with your customers when they have questions. 5. Payment made by the buyer will be transferred to you immediately. 7. Get useful business insights such as your sales history, best-selling item and other analytics to optimize your business set your own pricing, upload your logo and we will get the word out ! There are no contracts and you may cancel at any time. There are no contracts or obligations, you may cancel at any time. Why not use our marketing staff, design team and customer base to gain additional exposure for your products and services. Our 15-year reputation for dependable service and 40,000 unique visitors per month will give you the exposure you need to jumpstart your business to a targeted market looking for unique products. .
APRIL 1, 2018 SO MAKE SURE YOU REGISTER SOON! Fair Trade is a strategy for poverty alleviation and sustainable development. Its purpose is to create opportunities for entrepreneurs and producers who have been economically challenged or marginalized by the conventional trading systems.